In my life I’ve read thousands of books. I am typically reading two books in hardcopy, another on my Kindle, and one via Audible in my car. I am generally a one-and-done reader, though I do have handful of books I’ve read over and again in the course of 50 years. But never have I read a book and so wanted to read it again IMMEDIATELY. What do you when life is catastrophically interrupted? What does it mean to have a child as your own life fades away? What makes life worth living in the face of death? 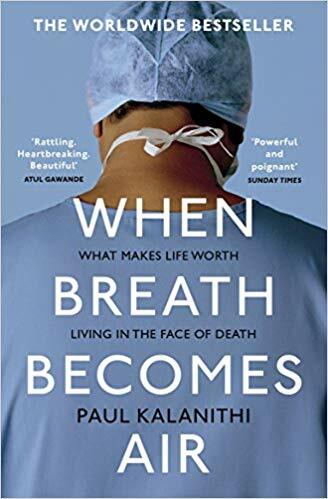 At the age of 36, and on the verge of completing a decade of trainings as a neurosurgeon, Paul Kalanithi was diagnosed with inoperable lung cancer. One day he was a doctor treating the dying, the next he was a patient struggling to live. This book is beautifully written: moving and raw and authentic and brutally honest. It’s about death and dying AND about living and driving impossibly difficult decisions AND it’s about mastery and endurance and humanity and vulnerability and philosophy applied to real life, woven around one man’s search for meaning through the intersection of mind/awareness (what makes us human?) & the brain (the science-how it works) & what happens when an entire life comes crashing down in the moments following a diagnosis of cancer. It is one of the best books I’ve ever read. Ever. I read it in a day and a half and experienced a million emotions, from out-loud laughter to sobbing tears, and it left me crying at the end. Yet it challenged me to look at life a different way. Bonus: since Kalanithi was studying neuroscience, there’s actually some cool learning in the book! Powerful. I’m reading it again.